I’ve posted before about the cloud frequency map that I created using Google Earth Engine. This post is just a quick update to mention a couple of changes. 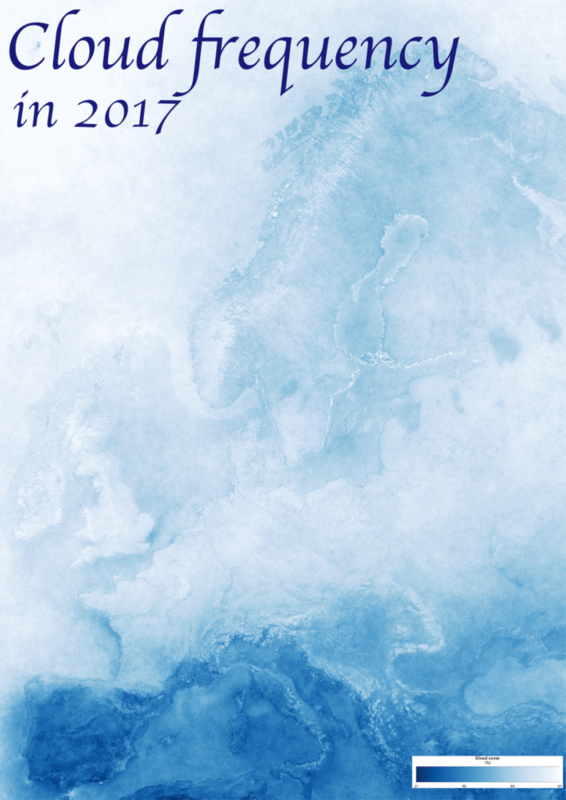 Firstly, I’ve produced some nice pretty maps of the data from 2017 over Europe and the UK respectively. I posted the Europe one to the DataIsBeautiful subreddit and got quite a few upvotes, so people obviously liked the visualisation. The two maps are below – click on the images to get the full resolution copies. Interestingly, you can see quite a lot of artefacts around the coast – particularly in the UK one. I think this is a problem with the algorithm that occurs around coasts – or at least discontinuities from the different algorithms used over land and water. I’ve also updated the interactive cloud frequency web app to use data from 2017. This is an old post that I found stuck in my ‘drafts’ folder – somehow I never got round to clicking ‘publish’. I attended EGU in 2016, and haven’t been back since – so things may have changed. However, I suspect that the majority of this post is still correct. Right, so, in case you hadn’t guessed from the title of this post: I use a wheelchair. I won’t go into all of the medical stuff, but in summary: I can’t walk more than about 100m without getting utterly exhausted, so I use an electric wheelchair for anything more than that. This has only happened relatively recently, and I got my new electric wheelchair about a month ago. For a number of years I’d been trying to go to either the European Geophysical Union General Assembly (EGU) or the American Geophysical Union Fall Meeting (AGU), but I either hadn’t managed to get any funding, or hadn’t been well enough to travel. This year, I’d had two talks accepted for oral presentation at EGU, and had also managed to win the Early Career Scientists Travel Award, which would pay my registration fees. So, if I was going to go, then this year was the right time to do it… I decided to ‘bite the bullet’ and go – and it actually went very well. Friends, family – and even strangers – often want to be supportive. The most common phrase is: “Don’t worry, I’m sure it will be fine.” After all, accessibility is a legal requirement so that shouldn’t be a problem. And you want to make me feel better about the trip. But think about it: Do you really understand all my needs and differences, and have an equally detailed knowledge and of everything that might present challenges, and suitable solutions to each one from the moment I leave my home until I return to it again? 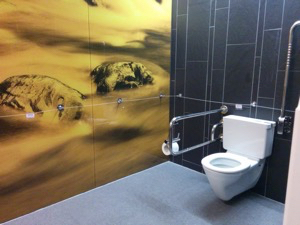 Have you inspected the accessible loos and checked the temperature control in the rooms? Do you realise how many places that call themselves ‘accessible’ have steps to the bathroom or even steps to the entrance? Most of the information I could find before going was of this ‘everything will be fine; it is accessible’ type – and so that’s why I am putting all of the details in this post: hopefully it will make someone else’s life far easier in the future. Although I’m writing primarily from the point of view of a wheelchair user, I’ve also tried to think about some of the issues that people with other disabilities may experience. I’ll start with the things that will be most generally applicable – in this case, the venue. EGU is held at the Austria Centre Vienna, close to the Danube in Vienna. 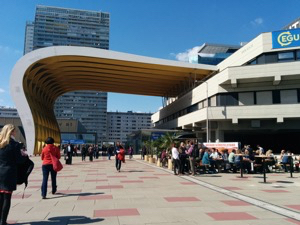 The EGU website helpfully stated “The conference centre is fully-accessible”, but gave no further details – and most disabled people have learnt from painful experience not to trust these sorts of statements. 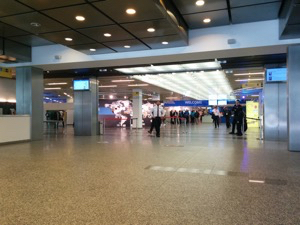 The entrance to the conference centre is large and flat. There are automatic doors into the ‘entrance hall’, and then push/pull doors into the conference centre itself (they are possible to open in a wheelchair, but most of the time people held them open for me). 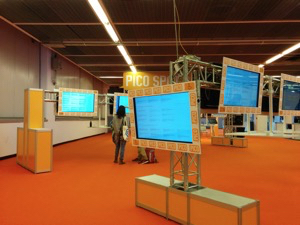 Some of the poster halls are in a separate building (although they can be accessed by an underground link from the main conference centre). The entrance here isn’t totally flat: there is a small, but significant bump (‘mini step’) which my electric wheelchair didn’t like. Going in the door backwards worked, but that can be a bit difficult if there are lots of people around. 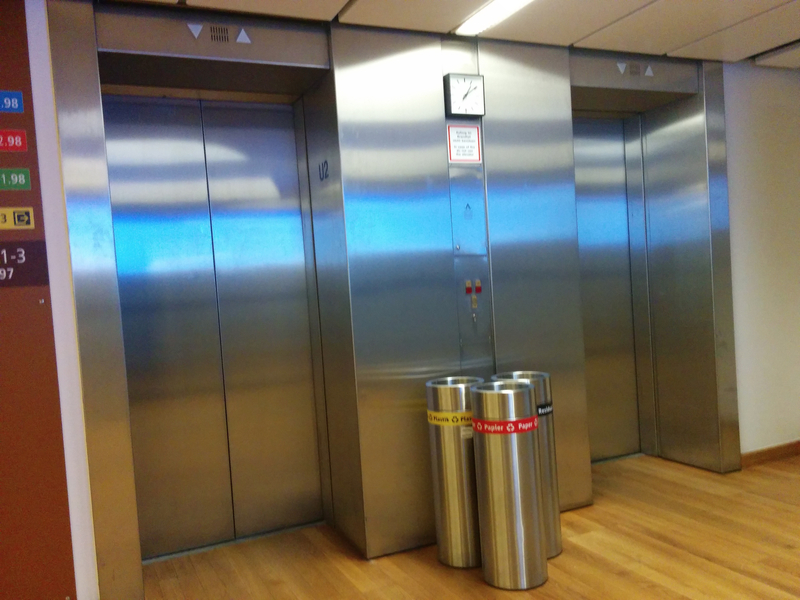 The lifts are of a reasonable size, with enough space for me to turn my wheelchair around inside them. I could reach the buttons inside the lifts, but people who have shorter arms than me might struggle to reach from their chair. Also, as far as I could see, there were no braille markings on any of the buttons, which would make it difficult for a visually-impaired person to use the lifts. 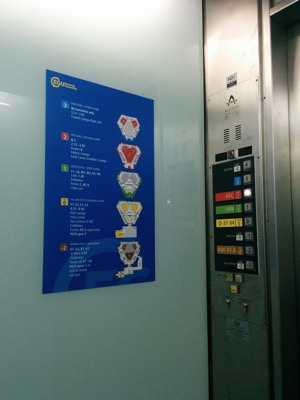 The other minor issue with the lifts was that it was sometimes difficult to reach the call buttons for the lifts, as a set of recycling bins were usually located directly in front of the call buttons (I have no idea why…). I could reach ok most of the time, but people with shorter arms than me would struggle. One thing that you may have noticed from the pictures above is how well-signed everything is: this was a really pleasing aspect of the conference organisation. As you may also have noticed from the maps, the building is symmetrical in a number of axes, so it could be hard to work out where you were (everything kinda looked the same…) – so the maps and signs were much appreciated! As you can see, the floor is entirely flat here, so it is very easy to get anywhere you need to get to. When listening to talks in these sorts of rooms I tended to place my wheelchair at the end of one of the rows of seats, or – if appropriate – ask someone to move one of the seats out of the way to give me space to fit into a row properly. When I gave a talk in one of these sorts of rooms, I spoke from my wheelchair at the front of the room (directly underneath the projection screen), with a portable microphone and a remote to change the slides. I didn’t use the official lecturn as in my chair I would have been hidden entirely behind it – and I’m not sure the microphone would have reached properly! I haven’t got a photo of any of the larger rooms, but they have a stage at the front – which obviously makes things a bit more difficult for wheelchair users. I was offered a range of ways to present in that room: from my wheelchair on the main floor (ie. not up on the stage), or walking up the stairs to the stage and presenting from a seat behind the lecturn, or presenting from a seat behind the convenor’s table on the stage. 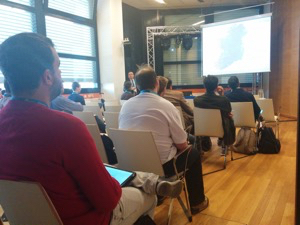 I chose the latter option, with a microphone and laptop to control the slides – but any of them would have worked. Each time when trying to sort out the arrangements for my talk, I found the ‘people in yellow’ (the EGU assistants in yellow t-shirts who sort out the presentations, laptops and so on) to be very helpful in arranging anything I needed. The exhibition area was generally accessible with two unfortunate exceptions: both the Google Earth Engine stand and the EGU stand were on a raised platform about 3 inches off the floor…very frustrating! I expressed my frustration to the people on the EGU stand and was assured that this wouldn’t be the case next year. All of the rest of the stands were flat on the ground and I could access them very easily. It’s difficult to show the full size of the toilet without a fisheye lens, but they were large enough to get my wheelchair in and still have a fair amount of space to move around (far better than the sort of ‘disabled’ toilets that will barely fit a wheelchair!). They were also clean, nicely decorated, and had all of the extra handles and arm-rests that should be present. 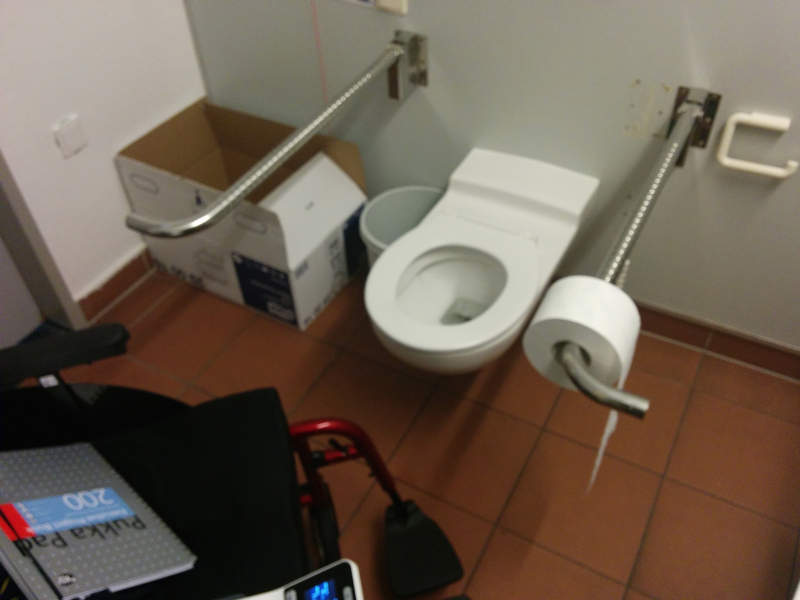 What’s more, the space next to the toilet itself was kept free so that if you needed to transfer directly from a chair to the toilet then that would be possible. All of the toilets in the main part of the conference centre were like the example above – very impressive – but unfortunately the toilets in the other building (which contained poster halls X1-4) weren’t as good. They were still better than some toilets I’ve used, but they had turned into a bit of a store-room making them cluttered and difficult to manouvere around, and also stopping anyone from transferring directly from a chair to the toilet. 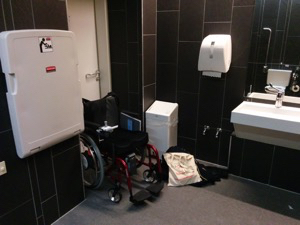 In this building the disabled toilets were also located in such a way that the open door to the disabled toilet would block the entrance to one of the ‘normal’ toilets…and this means that when you open the door to come out of the toilet it is quite easy to almost knock someone over! In summary, things worked remarkably well, and accessibility was good. 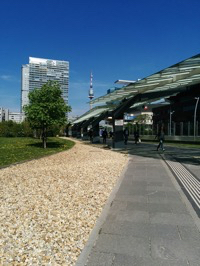 I would have no hesitation in attending EGU again, and using my wheelchair while there. I really enjoy reading blogs. That seems to be a slightly outdated view, as many people have moved over to using Twitter exclusively, but I like being able to follow everything that a specific person writes, and seeing mostly long-form articles rather than off-the-cuff comments. Back in the day, when blogs were really popular, every blog used to have a ‘blogroll’ listing other blogs they subscribed to. That doesn’t seem to be a ‘thing’ any more – but I thought I’d put together my own blogroll. So, this is a list of blogs to which I subscribe. Programming – a range of topics are covered here, including language-specific blogs (mostly Python and R) and general programming blogs. Sadly, many blogs have stopped publishing regular articles, but their archives are well worth a read. The Endeavour – a combination of maths, statistics and programming. The maths often goes a bit over my head, but I like it anyway. Joel on Software – very few posts recently, but some absolutely wonderful archives from many years ago. These were the source for Joel’s two books. Conveniently the homepage has an index of some of the best articles – go and read them! Stevey’s Blog Rants – some interesting general programming articles, but for the really good stuff you need to go to Stevey’s Drunken Blog Rants where pretty-much every article is worth reading. Coding Horror – same as above, some great articles many years ago, the recent stuff isn’t so good. General Computing – fewer blogs here than I used to read, but a good way to keep up with a few areas of computing. Ken Shirriff’s blog – absolutely fascinating blog about electronics and antique computers, ranging from punched card machines to early GUIs. Scott Hanselman’s Computer Zen – general computing/programming articles, with a Windows and ASP.NET focus. Less good these days, but the archives are good. Remote sensing and GIS – many of these have also stopped publishing recently, and in general there are far too few remote sensing blogs. If you know of any more then please let me know! 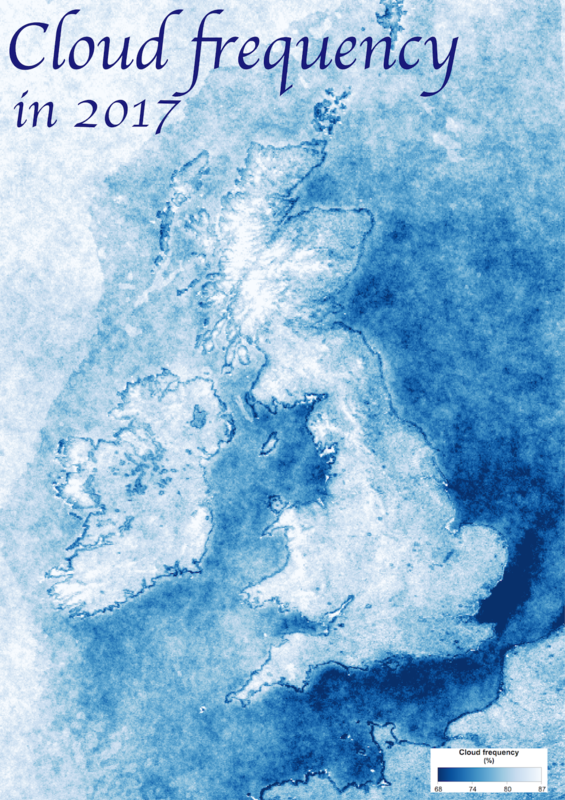 Ordnance Survey Blog – always good to keep an eye on what the national mapping agency are up to, particularly as my wife works there! General academic – I think all of these are actually posting articles regularly. Hooray! PHD Comics – this has to be near the top, great cartoons of what it is like to work in academia. I own multiple PhD Comics books. The archives are great. ME Association – UK association for people with ME and those who support them. Regular articles with ME-related news. I particularly like the summaries of published research. Stickman Communications – blog of a great company who make lots of products to help those with disabilities, all featuring stickmen. I use many of their products. The Social Worker Who Became Disabled – another long dormant blog, but with some interesting archives. From a friend who also has ME. Letters | guardian.co.uk – letters to The Guardian newspaper in the UK, often interesting and sometimes controversial. The Secret Teacher | The Guardian – The Guardian’s Secret Teacher series. Depressing, but enlightening. Trent Hamm – The Simple Dollar – I think the archives are better than the more recent posts, but this blog really helped me sort out my financial situation a few years ago. Ionia Guest House – the blog of a former supervisor of mine who is currently building a hotel in rural Turkey. Fascinating insight into the building process, and a good way to keep up to date with an old friend. Traveller C – the blog of an artist/illustrator friend of mine – look at some of the images in the archives! I am first author of this paper, alongside over a dozen others from the Flowminder Foundation. It details work that we did in response to the 2015 Nepal earthquake, where we used mobile phone data to analyse population movements resulting from the disaster. I led this project, and – a while after we’d finished providing data to the aid agencies in Nepal – I co-ordinated the writing of the paper. This video was part of our submission to the Global Mobile Awards 2016, and I’m very proud to say that we won in the Mobile in Emergency or Humanitarian Situations category. The judges commented that this was “A brilliant example of how the application of big data analysis to mobile technologies can be used to accelerate emergency aid, and provide intelligence to help prepare for future disasters.”. I’m also pleased to say that this paper has 26 citations (at the time of writing) – tying for first place with my Py6S paper. Reference: Wilson, R., zu Erbach-Schoenberg, E., Albert, M., Power, D., Tudge, S., Gonzalez, M., Guthrie, S., Chamberlain, H., Brooks, C., Hughes, C. and Pitonakova, L. et al., 2016, Rapid and near real-time assessments of population displacement using mobile phone data following disasters: the 2015 Nepal Earthquake. PLoS currents, 8. This paper came out of a collaboration with the London School of Hygiene and Tropical Medicine. The collaboration actually started with me providing some satellite-derived estimates of air pollution over a study area near Hyderabad, India for a project they were working on there. Alongside these I also provided some other satellite products, including satellite-derived night-time lights intensity data. They were interested in this for a number of other analyses that were taking place in that study area, and so I did some more work on the night-time lights data, calibrating it and providing data over the villages in the Andhra Pradesh Children and Parents Study (APCAPS). 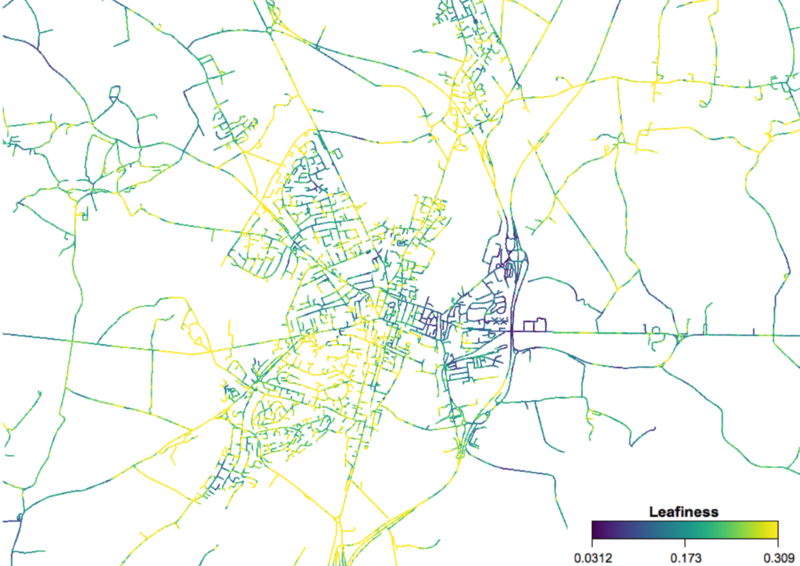 This night-time light data was then used as a measure of ‘urbanicity’ (the extent to which an area is urban) for each village, something which has been found to have a significant impact on health. In this study, villages which had a higher urbanicity were associated with more mobility in and around home for both women and men. Although night-time lights data has been used as a measure of urbanicity before, it is still relatively novel – and it has not been applied as a predictor for mobility before. This has potentially useful implications for predicting mobility of populations – and this is important because mobility has a significant impact on health (for example, affecting exposure to sources of disease). Reference: Sanchez, M., Ambros, A., Salmon, M., Bhogadi, S., Wilson, R.T., Kinra, S., Marshall, J.D. and Tonne, C., 2017. Predictors of daily mobility of adults in peri-urban South India. International journal of environmental research and public health, 14(7), p.783. This paper is another resulting from my collaboration with the London School of Hygiene and Tropical Medicine – and again it uses the night-time light intensity data that I processed for them. It is used as a measure of urbanicity again – although this time urbanicity is categorised as low, medium or high, and used as a predictor of breastfeeding duration. It was found that higher urbanicity was linked with a shorter duration of breastfeeding – something which is important, as longer breastfeeding duration is linked to many health benefits. Interestingly, this paper was published in the year that my son was born – so I was observing a lot of breastfeeding (and the issues associated with it) in my personal life. Reference: Oakley, L., Baker, C.P., Addanki, S., Gupta, V., Walia, G.K., Aggarwal, A., Bhogadi, S., Kulkarni, B., Wilson, R.T., Prabhakaran, D. and Ben-Shlomo, Y., 2017. Is increasing urbanicity associated with changes in breastfeeding duration in rural India? An analysis of cross-sectional household data from the Andhra Pradesh children and parents study. BMJ open, 7(9), p.e016331. This time, I want to move away from pretty images to some numerical analysis – and also move from a local scale to a national scale. My first question was: which is the leafiest place in the country? You can see here that lots of built-up areas are present, including many very small areas. You can also see that some areas are very large – built-up areas within a certain distance of each other are merged, which creates a ‘South Hampshire Built-Up Area’ which includes Southampton, Eastleigh, Chandlers Ford, Fareham, Gosport, Portsmouth and more. It’s rather frustrating from the perspective of our analysis, but I suppose it shows how built-up this area of South Hampshire is. 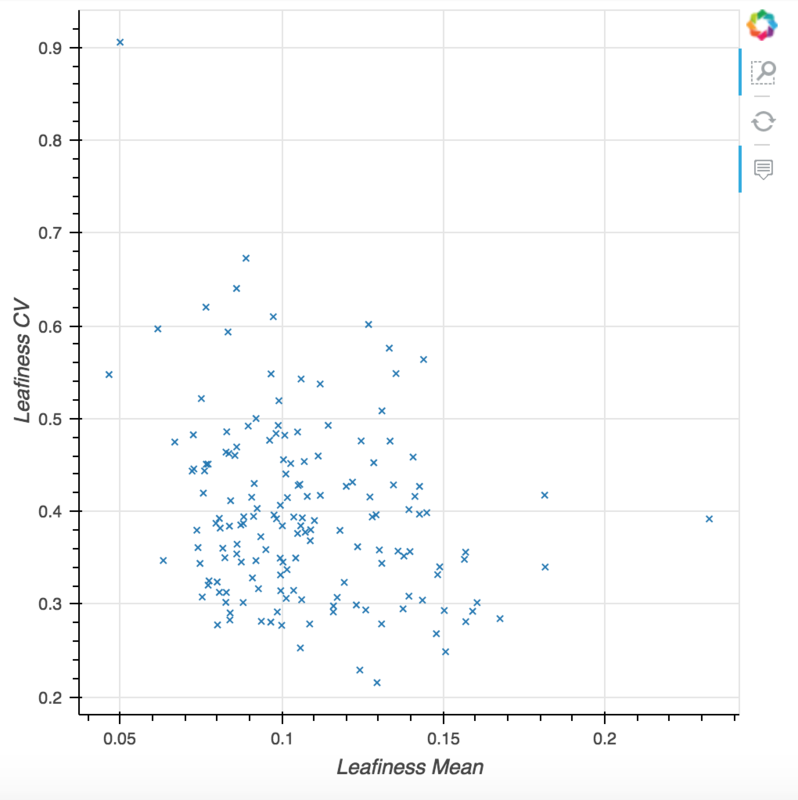 We can go ahead and export this aggregated leafiness data to CSV (I chose to aggregate using mean and median to compare them) to continue the analysis in Python. 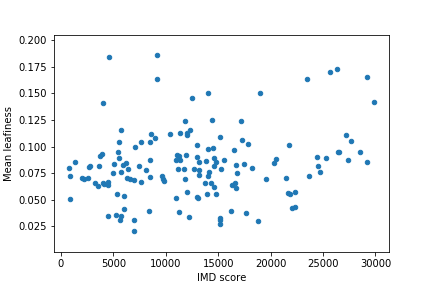 If you want to see how I analysed the CSV data then have a look at this notebook – but it’s fairly simple pandas analysis, and the main results are reproduced here. So – which are the leafiest places in the country? You can see that Winchester comes out top by a fair way. Winchester is probably the only one of these that I would have immediately thought of as very leafy – but that probably says more about my preconceptions than anything else. 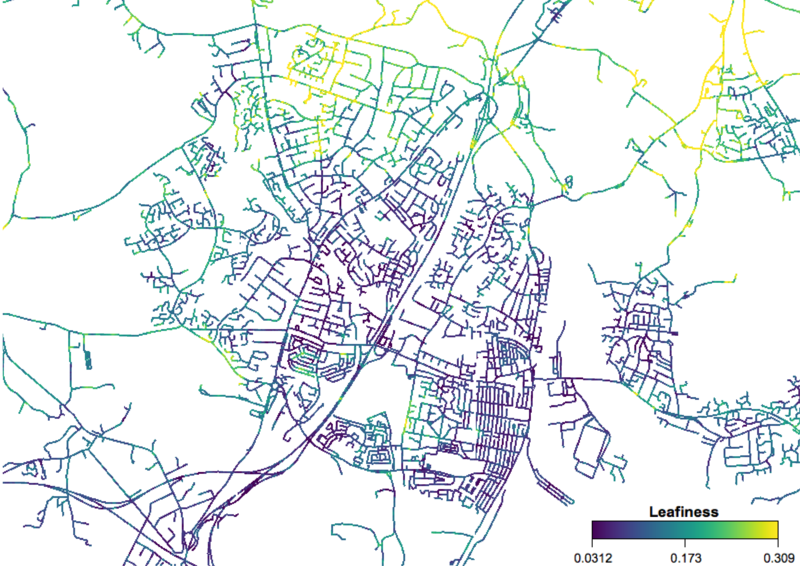 These were calculated using mean leafiness, but the top four stay the same, and the fifth entry is Great Malvern. I think that is likely an anomaly as the built-up area outline for Great Malvern actually includes Malvern Link, West Malvern, Colwall and a number of other smaller settlements nearby – and includes the green areas between these individual settlements. Embarassingly, I’d never heard of Grays – but it turns out it is on the banks of the Thames in East London, just east of the Dartford Crossing. 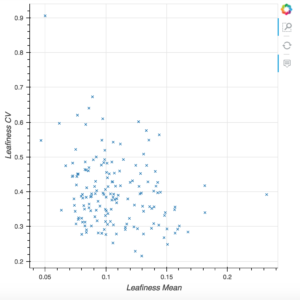 We can also plot mean against coefficient of variation, which allows us to examine where areas are placed when considering both the leafiness and the variability of this leafiness. The image below shows a static version of this graph – I actually produced an interactive version using my code to easily produce Bokeh plots with tooltips, and that interactive version can be found at the bottom of the notebook used to do the analysis. So, that’s the end of a fun bit of analysis – thanks to James O’Connor again for the idea. I was surprised to find that this took ages. It seemed to refresh the attribute table multiple times throughout the process (maybe after deleting each separate field? ), and that took ages to do (because the shapefile was so large). I then found I needed to do this process again, and looked for a more efficient way – and I found one. Unsurprisingly, it uses the GDAL/OGR command-line tools – a very helpful set of tools which often provide superior features and/or performance. This will select just the columns attribute1 and attribute2 from the file input.shp. Surprisingly this command doesn’t actually produce a full shapefile as an output – instead of producing output.shp, output.shx, output.prj and output.dbf (the full set of files that constitute a ‘shapefile’), it just creates output.dbf – the file that contains the attribute table. However, this is easily fixed: just copy the other input. * files and rename them as appropriate (or, if you don’t want to keep the input data, then just rename output.dbf as input.dbf). Regression in Python using R-style formula – it’s easy! I remember experimenting with doing regressions in Python using R-style formulae a long time ago, and I remember it being a bit complicated. Luckily it’s become really easy now – and I’ll show you just how easy. You may have noticed from the code above that you can just give a URL to the read_csv function and it will download it and open it – handy! The ‘formula’ that we used above is the same as R uses: on the left is the dependent variable, on the right is the independent variable. The ols method is nice and easy, we just give it the formula, and then the DataFrame to use to get the data from (in this case, it’s called df). We then call fit() to actually do the regression. We can easily get a summary of the results here – including all sorts of crazy statistical measures! We can also see if introducing categorical variables helps with the regression. In this case, we only have one categorical variable, called Origin. Patsy automatically treats strings as categorical variables, so we don’t have to do anything special – but if needed we could wrap the variable name in C() to force it to be a categorical variable. You can see here that Patsy has automatically created extra variables for Origin: in this case, European and Japanese, with the ‘default’ being American. You can configure how this is done very easily – see here. This is just a very brief reminder about something you might run into when you’re trying to get your code to work on multiple platforms – in this case, OS X, Linux and Windows. Basically: file names/paths are case-sensitive on Linux, but not on OS X or Windows. which you might use to open part of a Landsat 7 image – and it would work absolutely fine on OS X and Windows, but fail on Linux. I initially assumed that the failure on Linux was due to some of the crazy path manipulation stuff that I had done to get base_path – but it wasn’t. It was purely down to the fact that the file was actually called LE72020252003106EDC00_B1.TIF, and Linux treats LE72020252003106EDC00_B1.tif and LE72020252003106EDC00_B1.TIF as different files. I’d always known that paths on Windows are not case-sensitive, and that they are case-sensitive on Linux – but I’d naively assumed that OS X paths were case-sensitive too, as OS X is based on a *nix backend, but I was wrong. If you really have problems with this then you could fairly easily write a function that checked to see if a filename exists, and if it found that it didn’t then tried searching for files using something like a case-insensitive regular expression – but it’s probably just easiest to get the case of the filename right in the first place! This is a quick post to brief describe a problem I ran into the other day when trying to debug someone’s code – the answer may be entirely obvious to you, but it took me a while to work out, so I thought I’d document it here. which I thought was very strange, as there was definitely only one value of a given in the call to that method. If you consider yourself to be a reasonably advanced Python programmer than you might want to stop here and see if you can work out what the problem is. Any ideas? You may have noticed the problem now – although at first glance I couldn’t see anything wrong… There was definitely only one parameter called a, and it definitely wasn’t being passed twice…so what was going on?! As you’ve probably noticed by now…this method was missing the self parameter – and should have been defined as do_something(self, a, b). Changing it to that made it work fine, but it’s worth thinking about exactly why we were getting that specific error. which is obviously ambiguous – and so Python throws an error. Here we are defining a function that takes two arguments, and then calling it with a single positional argument for a, and then using the ** method of dictionary unpacking to take the dictionary d and convert each key-value pair to a keyword argument and value combination. But remember that the name self is just a convention, and Python will pass the instance of your class to your first argument regardless what it is called, which can cause weird problems. All positional arguments can be passed as keyword arguments, and vice-versa – they are entirely interchangeable – which, again, can cause problems if this isn’t what you intended.